Some of the hardest parts of carpentry is making ugly stuff disappear. The bracket I put to hold up my 2nd floor: perfect example. I spent a full day trying to build a fake newel post and work that into the overall crown design downstairs. Its almost impossible for me to compose a weblog post about this. It was the single most difficult carpentry task I ever had to face in my life. What else do I hate about this house? (do you have a few spare hours?) 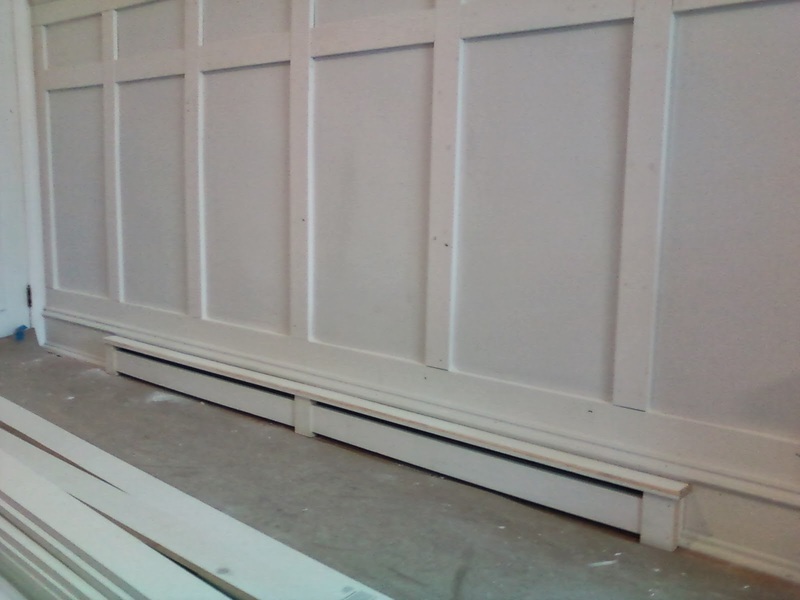 The baseboard radiators. Heat transfer-wise, it doesn't work either. You can't add copper finned tube when the rest of the house is on cast iron. They require different flow rates to be effective. I'm so annoyed about it that I'll just stop right there. Why don't I just shut and and get to posting the pictures? The waintscot was a real success story. I got through it in about 1.5 hours after work. Now, it wasn't exactly 100% that night (because of this damn baseboard finned tube) but it was like 90%. Good enough to post a picture I guess. The walls were wavy so I put construction adhesive on the backs of every board. Some of them need a real bend to stick on the wall. Since the wall is plaster-on-brick, anything that helps it adhere would be beneficial. 18ga trim nails tend to curl over. 16ga will too if they are too long. I've found that 16 ga. 2" nails will do the trick until the adhesive sets. Now, I want an even reveal with every board. The boards are you classic pre primed finger jointed stock straight out the yard. Layout included 3'-11 7/8" verticals... that way i could get four (4) verticals out of a single $8 board (including the saw kerf). Like the cabinet birch ply (ripped to 11 7/8" on the long side), I was able to get four final pieces out of stock lumber.. with only saw dust for waste. I live for these moments. To get that even reveal, I need to plan way ahead. I want the tops and bottoms to *appear* as 3 1/2" on the flat, just like the adjacent verticals. 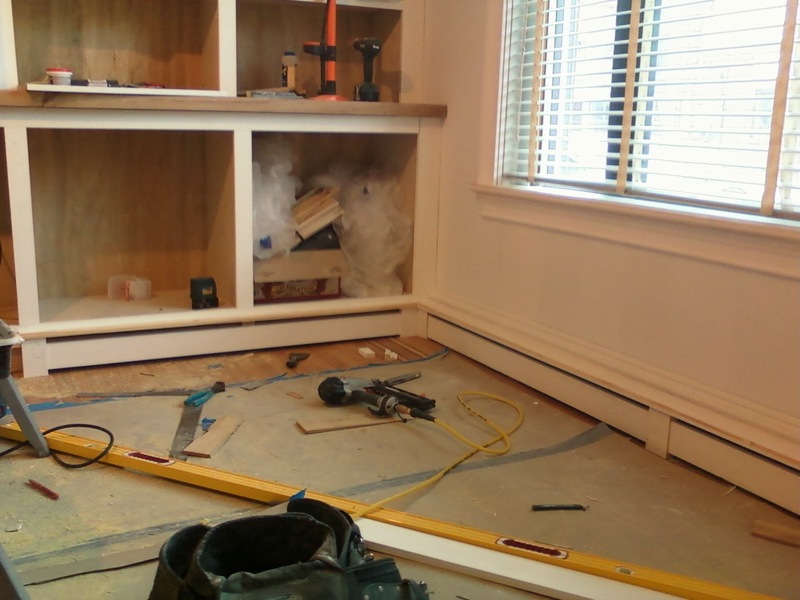 That means the baseboard trim, base cap, and finned tube rad cabs all need to be laid out in advance. Similarly, the top piece of rake and top cap all need to be factored in. I found a standard 2" piece of rake in the millwork catalog so I just thew that on top of a 1x6 (5.5 - 2 = 3.5 reveal). Done. At the bottom the situation is more complex. Base+Cap wants to be around 8" on average. But I want to sneak this baseboard cabinet under my base cap. My base cap is fancy. I don't mess around on this type of stuff. Sure, investing too much money in ornate baseboard trim is probably like flushing money down a toilet. I don't care. My base has to look primo. Damn the torpedoes. Let's just get to work. Pack out to the front of wainscot plane with some spare scraps. Oh yeah. Better run some romex up into this base. We're gonna need an outlet somewhere on this wall. I really just needed to tie this all together somehow. Those metal cabinets that were issued in the 70s just aren't an option. They almost embarrass me out of my own home on a daily basis. And I have little-to-no-shame. I did rip off the front piece of the metal cabinet and stuffed it behind the finned tube as a bit of a "heat shield" to reflect it away from the wall. I had to tapcon it to the brick, and it was a son of a b. Its funny how stupid things like that wind up being the bulk of the project. Night view through my vampire eyes. I may not be able to see my own reflection in the mirror, but at least I can see this. It probably looks a whole lot better too. Just look at those shadow lines. Am I the only one who is into this? Another angle. Because three pictures just isn't enough. I just used a 3/8" round over bit on the top to make a bullnose of sorts. It looks good. It also might be hard to see but I made the pilasters (vertical) more pronounced than the rails. Small detail that probably took too much time, but I wound up doing exactly what I wanted to do. So it may have been worth it. I don't know. I mean, I am the one who has to live in this place, right? The next area takes the woodworking skills to the next level. Wrap around finned tube that goes under the built in. Brutal. What was I thinking? I guess that I didn't want to seal in 60% of the heat output in the living room. I don't care how much cheap natural gas we get from fracking. Waste is waste. Zoomed in. Floor is not level. New base cap is level. You know that means: custom layout for covers. Installed. See how it wraps onto the built in? Pure genius or true idiocracy.. only time will tell. Zoom out. Lower shelves cut to fit and faced framed as well. A couple more photos from ye olde flip phone. And that my friends, is the final woodworking project in these two rooms. I am so psyched to see this place!! !